Lookin for some fall fun? Experience the D.C. area's rich culture through its annual festivals. Whether you’re a book, food or music junkie, you're sure to find something that captures your attention. If you are willing to withstand opening weekend crowds, head to the new development, The Wharf, for fireworks, award-winning food, music and more. Yoga will be offered on the pier on Saturday, and Howard's gospel choir will be in attendance on Sunday. When: Saturday, Oct. 14, 11 a.m. - 3:30 p.m.
More than 550 antique and classic automobiles will be on display at Rockville's 2017 antique car show. This free event also has a flea market and car sales area, with food available for purchase. The last day to pre-register your car is Wednesday Oct. 11. Day-of registrations are also allowed. Where: All Saints Church Festival in Chevy Chase, Md. Eat treats from Surfside and Rocklands BBQ, or check out the bake sale, live music, bounce houses and petting zoo. A pumpkin patch will also be at the event, making it a fun fest for young kids. Stop by IlluminAsia for a festival of Asian art, food, and cultures to celebrate the grand reopening of the the Freer and Sackler Museum. The festival offers music, arts and crafts and delicacies in an Asian style market. The event is free and open to the public. When: Saturday Oct. 14, 10 a.m. - 2 p.m. Kick off your fall festivities with pumpkin carving, costumes and a parade at Frager's Fall Festival. Come hungry -- food, free cider and trick-or-treating will also be available. At 1 p.m., there will be a DIY demo, where attendees can learn how to make a skeleton from PVC pipes. When: Saturday Oct. 14, 10 a.m. - 6 p.m.
Where: Along Tom Davis Drive in the center of Annandale, between Columbia Pike and John Marr Drive. Join residents of Annandale for the third annual Taste of Annandale festival. Food trucks galore, along with live entertainment and a 5K race are all features of the fest. Its goal is to celebrate community engagement, diversity and spotlighting local businesses. The streets of Bethesda Row transform into an outdoor art gallery, with vendors offering ceramics, drawing, pastels, fiber, decorative, fiber, wearables, glass, graphics/printmaking, jewelry, metalwork, mixed media 2D, mixed media 3D, oil/acrylic painting, photography, digital art, sculpture, watercolor, and wood artwork for sale. The event is ranked 53rd of elite art fairs by Art Fair Sourcebook. When: Sunday, Oct. 15, noon - 4 p.m. This free festival is held evert year in October to celebrate the rich diversity of Montgomery County. Stop by for the festival's international village, hands-on activities, Ethiopian coffee ceremonies and henna art paintings. When: Friday, Oct. 27, 11 a.m. - 8 p.m.
Where: 425 M Street SW, Washington, D.C.
Local vendors at this curbside cookoff will compete for The Golden Spatula while promoting the regional food truck industry. Festival-goers will have a chance to sample some of the DMV’s most popular food and drinks. Once you're done licking your fingers, you can cast your vote for the best. With free games and live music, the Curbside Cookoff can’t be beat. Each purchased ticket includes four tastings, one drink, free games, dancing and live music. Free entry tickets do not include food and drinks. On-site food and drink purchases cost more, so it's better to purchase tickets beforehand. Online ticket sales close Oct. 13 at 10 p.m. When: Saturday, Oct. 7, 11 a.m. - 4 p.m.
Held rain or shine, Bethesda’s food and music festival brings out 60 restaurants and five stages of entertainment. Taste tickets are sold on-site, with bundles of four available for $5. But ticket sales end at 3:30 p.m. The complete list of participating restaurants can be found on their website. Do you really think you’re about to miss the largest culinary festival in the mid-Atlantic? 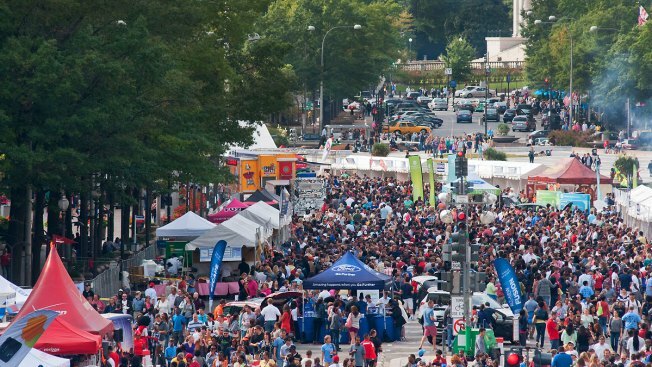 Bringing together taste buds from all over since 1989, Taste of DC features four blocks of culinary delights. Food and beverages can be purchased by activating your "Tasteband" and loading "Taste Tokens" to your wristband online or at stations throughout the festival. Between Ben’s Chili Bowl’s World Chili Eating Championship, main-stage events and an artisan market, the two-day event welcomes you to sip, savor and celebrate all weekend long! When: Saturday, Sept. 16, noon - 7 p.m. This annual celebration highlights the growth of the H Street corridor and its nearby businesses. According to a press release, the festival is expected to attract over 150,000 guests. The festival includes more than 500 performers and artists, over 70 food vendors, a kids zone, cosplay costume contests and more. Watch some of the Air Force's finest aircrafts, including Thunderbirds, F-22 and World War II-era propeller planes, shoot through the sky. Opening ceremonies begin at 10:30 each day, and shuttles will go from FedEx Field to the show until 1 p.m. each day. Where: The parade will be held near the National Mall, and the festival at Pennsylvania Avenue between 3rd and 7th streets. Fiesta DC has been celebrating Latino culture in D.C. for 46 years. The parade will feature dances and local groups, while the festival will have concerts, vendors and, of course, delicious food. Take advantage of one of 50 free walking tours. Tours are offered at several lengths and fitness levels, with some being wheelchair-accessible. Tours can take you from St. Paul’s Rock Creek Parish to Dupont Circle, from Congress Heights to Herring Hill and on many other routes. The tours are all led by licensed historians, docents and community leaders who volunteer their time. Venture to Ocean City, Maryland, for its biggest annual festival. The free festival offers arts and crafts, hayrides, food vendors and musical guests. Country singer Clint Black and Grammy winner Christopher Cross will perform on Friday and Saturday, respectively. When: Saturday, Sept. 23, 7 p.m. - 3 a.m.
D.C.’s free overnight arts festival includes all aspects of art. Guest will have all night to explore art in six D.C. neighborhoods. Based on a festival concept that began in Paris, Art All Night offers an exciting opportunity for local artists and business to showcase their products. Be sure to reserve your free neighborhood pass online before heading out! When: Sunday, Sept. 24, 11 a.m. - 4 p.m.
Where: K Street NW, Washington D.C. 20007, between Wisconsin Ave and Thomas	Jefferson Street. Celebrate Taste of Georgetown’s 24th year by attending their annual foodie festival. They will have food and drink options from over 30 local restaurants. The event, which is hosted by Washingtonian Magazine and Georgetown BID, will benefit the Georgetown Ministry’s mission to help the homeless. The festival is free to attend, but advanced tasting tickets can be purchased at www.tasteofgeorgetown.com.